It may not seem like much now, but 1989-90 NBA Hoops Basketball was the beginning of a big shift in the basketball collecting world. Strong exposure and the timely release of a key rookie card pushed the product to the top of the hobby for a period. Although that value is largely gone, 1989-90 NBA Hoops Basketball still represents an important moment for collectors thanks to the only rookie card for David Robinson. 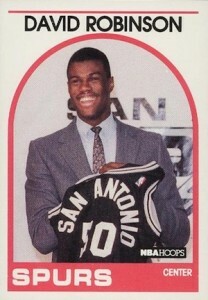 One of the more hyped talents of that period, David Robinson was selected first overall in the 1987 NBA Draft by the San Antonio Spurs, but military obligations kept him off the court until two seasons later. 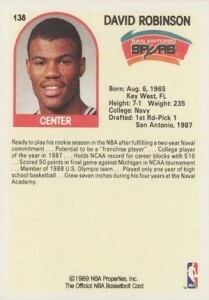 Rookie cards were certainly not a new concept during the 1989-90 NBA season, but the unique set of circumstances allowed for David Robinson's rookie card to be released during his actual rookie season. 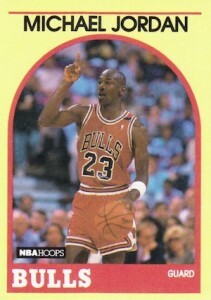 Up until then, it was common for collectors to wait a year or more for the "rookie" card of an NBA player to be issued. The unanimous 1989-90 NBA Rookie of the Year and an All-Star in his first season, David Robinson took the league by storm and collectors did not have to wait to try their luck for his rookie cards. The demand was so strong for his rookie card that counterfeits entered the market. In retrospect, this seems a little crazy for a card that can now be found ungraded for just a few dollars. To be fair, high grades of the Robinson rookie card still have solid value. A BGS 10 sold for $799.99 in June of 2015. Like most of the cards from this period of collecting, time was not kind to the design or value of 1989-90 NBA Hoops Basketball. The simple base design includes an outline of the paint and high post, with the player's name at the top of the card and the team nickname at the bottom. 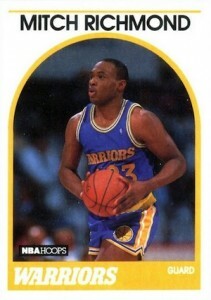 Series 1, which includes cards #1-300, houses several notable rookie. David Robinson is joined by Dan Majerle, Kevin Johnson and fellow Hall of Fame inductee Mitch Richmond. 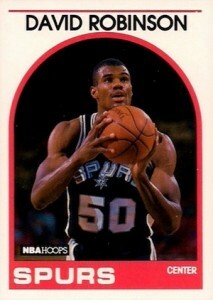 The Series 2 run only includes 53 cards (#301-353) and a second card for David Robinson. In order to make room on the printing sheet for the set, multiple cards, including the David Robinson rookie card, were removed. This technically results in quite a few short prints from Series 1, but the term is used loosely and all cards are in great supply. 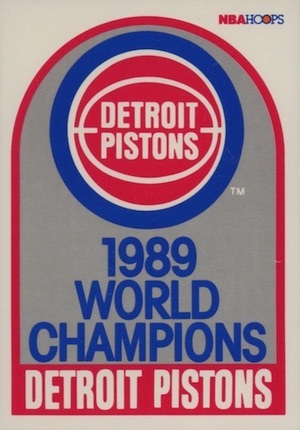 In reality, the only 1989-90 NBA Hoops Basketball card that actually is somewhat rare is the Detroit Pistons card that falls at the end of the checklist and honors their 1989 title. A second version that displays the team logo is also available, but was only obtained through the mail from Hoops. Similarly, checklist cards for each series can be found but were also issued through the mail. 353. Shop for base sets on eBay. Series 1 = cards #1-300; Series 2 = cards #301-353. SP = Series 1 cards dropped from Series 2 boxes to add new cards; AS = All-Star. 100 cards from base set with different card numbering. Sold separately. 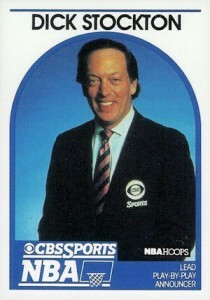 4 panels of 6 cards issued during the 1990 NBA All-Star Game weekend. 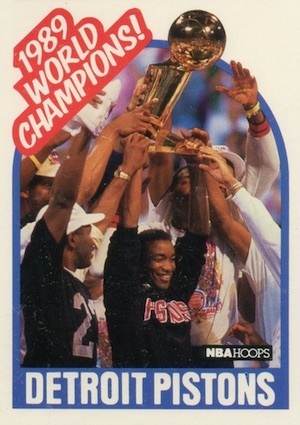 This set is known for the David Robinson RC. It gave Fleer a little competition and it was very popular. It happens to be a very affordable set and it has clean design and clear pictures. A rather good looking set. 1989-90 HOOPS LOW SERIES 1 BOX 36 15 NRMT MT! DAVID ROBINSON ROOKIE RC-JORDAN! !